This item was ordered as a gift for one on my daughters; she lives in another state so I was not privy to a personal view, only online. She was very happy with the gift; she especially liked the weight of the bracelet. So since she was happy, I was happy that she was happy. 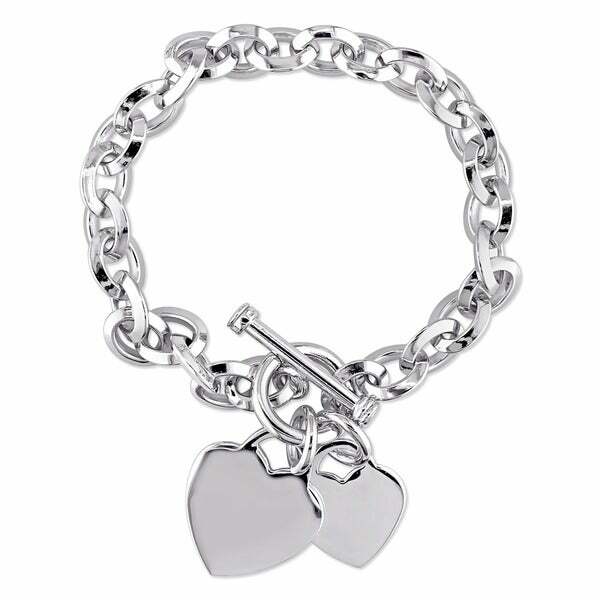 Showcase your fun, charming style with this beautiful Miadora double heart charm link bracelet. Featuring two smooth heart charms dangling from the toggle clasp, this darling charm bracelet exudes playful elegance. The sterling silver construction ensures lasting appeal and comfort. I purchased two of these bracelets for Christmas gifts. I gave them to each of my daughters, the larger heart I had engraved "With Love Mother" and their names on the smaller one. It was absolutely gorgeous and the meaning left them full of memorable emotions. The gift went over so well, I purchased a third one for a very dear extended daughter of mine. I had it engraved as well. Now I will purchase a fourth for a Family Reunion presentation to one of our family members. The engraving will be an everlasting impact on their life. This bracelet is awesome. So rich looking and absolutely beautiful. This is a beautiful large link silver bracelet. It has a toggle closure. There are two shiney hearts dangling, a small and a large one. I got it thinking it would make a cute gift but I've decided to keep it for myself. The links are thick enough that It can be used as a charm bracelet. Would fit best on a medium-sized wrist. It was a perfect little gift for my wife's birthday. (I knew she didn't REALLY want a vacuum.) Solid and shiny with a pleasant jingle when she wears it.I was a little disappointed with the packaging. It comes in an unpadded box and a velvet Overstock jewelery baggie. It could rattle around a lot in shipping. I wish the packaging would better protect the charms from the chain. It wasn't scratched, but it made me wonder. This come in a white cardboard bracelet box so no fancy packaging. It was a little heavy so I believe it was sterling silver, the problem we had with it was is our use of it. It was for my daughter's 6th grade graduation as she wanted to begin a nice charm bracelet and add nice charms over time. The links were too chunky for some charms to clip on and was overall just too chunky for what she wanted. If you are looking for that, then you will like this bracelet. We did return it and got a daintier one that would still hold charms at Piercing Pagoda. I shopped around for two weeks before I found this beautiful bracelet.The links are thick, large, solid and shiny. I ordered two one for my granddaughter age 5 the other for my daughter small frame. I had the small heart charm engraved with their initials, the larger heart says "With Our Love Always Nana / Mom & Grandpa / Dad plenty of room. True to size for small wrist under 7 inches. This will be their keepsake gift as they will both stand in when my husband and I renew our 40th Wedding Anniversary Vows. Perfect for our Heart theme. This sterling silver bracelet is heavy gauge which I wanted. The 2 dangling hearts are not too thin. I was afraid they would be thin but they are very nice. I would recommend this to anyone looking for this type of Toggle clasp bracelet. I bought this double hearts charm bracelet for my granddaughter, born on Valentine's Day 24 years ago. We have always called her "Sarah Sweetheart" and she will love this. The weight and quality of this bracelet is substantial, as promised. This bracelet is just okay. The length is not adjustable and that's a problem. It doesn't fall nicely on my wrist as it is way too long. This is such a great silver bracelet. Perfect to be worn anytime and the hearts are so nice on it. Makes a little noise when wearing, just the right amount to be heard but not to be distracting. I love, love this bracelet. Nice heavy weight to it and very shiny. Love the bracelet and the quality was great. I wish it did not cost so much but was worth it. This is a lovely bracelet. I bought it as a gift for a friend. She loves it! Tarnished way to quickly, nice bracelet till it tarnished. I got this for my daughter, to match something similar that I had previously purchased for my wife. She immediately took the chance to wear it whenever the two of them went out together. I absolutely love this sterling silver heart toggle bracelet and neck set. The weight of this jewelry is so heavy which proves the value is most definitely a good one for the customer. This was a very nice sterling silver bracelet. I still have it easy to clean hasn't tarnish. I believe any female would like this bracelet worth the price. "Is this charm bracelet designed to add other charms tonit?" It is not designed to have extra charms added but you could add them. This bracelet is approximately 8.78 mm wide 46.5 mm high x 7.5 inches long. "WHERE is this stamped Sterling Silver? I can't find the stamp. Makes me believe it isn't sterling since it's not marked." I purchased this bracelet several months ago. I only buy sterling silver and I owe tons. I'm pretty sure this is sterling. If it wasn't I would have had a rash all over my wrist. But, I looked over my bracelet with an led flashlight tonight and I do not see the 925 stamp either. Overstock please help us out. If this bracelet is a base metal refunds are due. This style is strictly sterling silver. The stamp is placed at the top loop portion of the heart charm. "How many grams in this two heart bracelet?" I recently purchased this bracelet because another review said it was a heavy well made piece. I was worried about the gram weight too. I still don't know the gram weight but I can tell you it is a heavy, well made piece. I think it weighs as much or more than my Tiffany bracelet. It's a good buy! "A product review posted on this site states that this bracelet is not sterling silver, just the hearts. Please verify that the bracelet links are also sterling silver"
Thank you for contacting us,the bracelet is sterling silver. Please let me know if you have any further question. The bracelet is sterling silver. I only buy silver jewelery. I never take it off and have not been disappointed. This bracelet is very substantial in weight and made entirely of sterling silver. I bought this for my daughter and was so impressed with its superior style and quality that I bought one for myself, also. "how many grams does this bracelet weigh?"